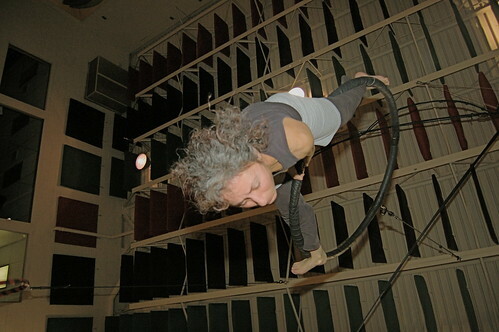 Hildy on the lyra, originally uploaded by nataraj_hauser / eyeDance. Another shot of the aerial dance work I'm involved with. This one has the dancer upside down and spinning on a lyra. It's essentially a large steel hoop suspended from the gymnasium ceiling by a single rope. This allows the lyra to spin as well as move in a wide circle. This shot conveys a bit of the disorientation and distress the dancer undergoes while learning to dance in the air. Very cool shot - nice composition, and I like the feeling of disorientation.